Tangle Tamer Brush: $7.32 w/ Free Shipping, Reg $19.99! This Has Awesome Reviews! Head over to Amazon and you can get a Remington Tangle Tamer brush for only $7.32 with free shipping. This has a list price of $19.99 and has awesome reviews. Out of 66 reviews, 60 of them are 5/5 stars! 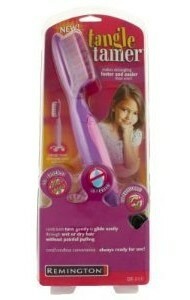 Use the Tangle Tamer just like you would a traditional brush or comb. Run it through wet or dry hair and watch the comb teeth twist and glide right through. Will comb through even the worst tangles - without painfully pulling hair. The Tangle Tamer is ready to use at any time; simply charge overnight for cordless use or plug in and use with the cord. Tangle Tamer makes detangling faster and easier than ever!